Hearing from God has become a laborious process that people have disqualified themselves from. In God Tone you will discover that God has designed us to hear Him as a normal part of our life. You will be encouraged in your identity and inspired in your relationship with Him. What man often complicates, God has simplified through the finished work of His Word – Jesus! You will know that God speaks from His point of view his Love. Learning to hear from how He defines you gives you the power to be who He made you to be. Hearing from God creates an unseen advantage to implement His plan through who you are not merely what you do. Success is determined by hearing God’s voice through relationship, not merely copying principles. You will hear the tone in which He speaks to you, which includes His love, logic, and intent for blessing your life. At the heart of any relationship is healthy communication. To communicate vibrantly, we must take confidence in the fact that Jesus has qualified us to hear the God Tone. Haans Erlandson is called to encourage identity in the unconditional love and grace of Jesus Christ through the joyful ministry of the Holy Spirit. Since 2000, he and his wife have been actively involved in the creative direction of US and International youth camps and conferences. For over a decade he has seen the supernatural power of the Word of God being demonstrated through a confidence in Jesus as our identity. He has seen thousands of people receive salvation in its many expressions, from the goodness of a loving Father God. With contagious joy, Haans shares on how to hear the voice of God and finding and operating in your gifts from the Holy Spirit. 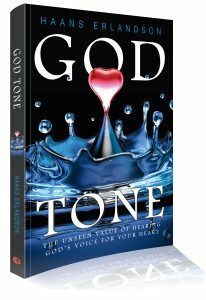 Haans and Sarah have an apostolic anointing and minister the gospel through speaking engagements and this, his first book God Tone. Haans and Sarah Erlandson reside in Fort Collins, Colorado, with their two children: Mahala and Ashton.